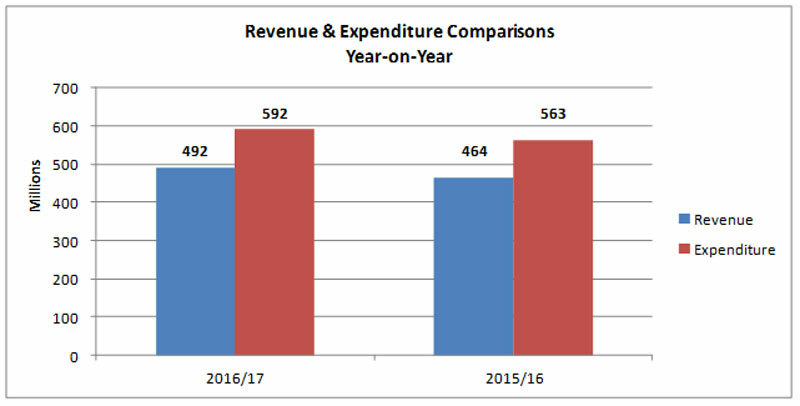 The Ministry of Finance today reported on the 2016/17 First Half Fiscal Performance and provided an updated Economic Review for 2016, saying that revenues for the six months ending September 2016 are $491.9 million; while current expenditures, excluding debt service, for the first six months ending September 2016 are $471.8 million. The headline numbers for the 2016/17 National Budget was: a revenue target of $996.9 million; current expenditure of $1.11 billion, including debt service; capital expenditure of $87.3 million; and a projected deficit of $199.4 million. Revenues for the six months ending September 2016 are $491.9 million; this is $27.6 million [5.9%] higher than in September 2015. The primary reason for this increase is due to an increase in Payroll Tax collections of approximately $18.4 million above 2015 collections, higher collections in Customs Duty of $6.0 million above 2015 collections and higher All Other Receipts of $3.3 million above 2015 collections. 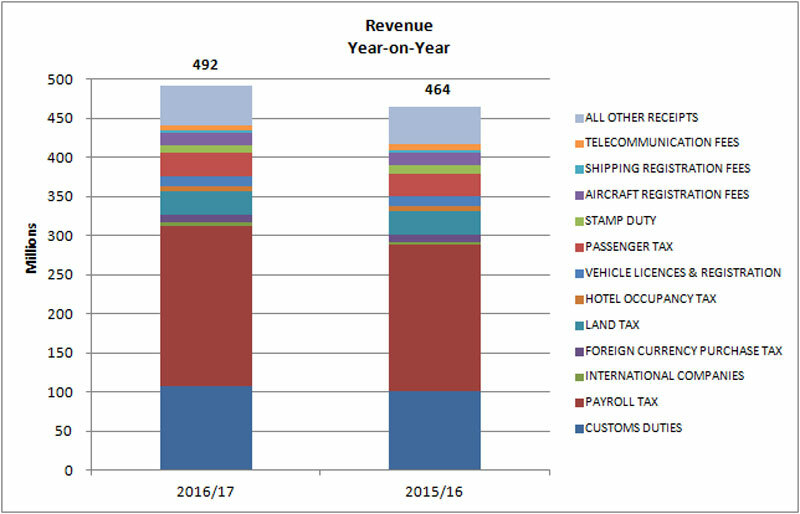 In general, total revenues are tracking slightly higher than budget estimates and the strength in Payroll Tax and Customs Duty receipts increases the chance of meeting the total revenue target of $996.9 million for the current fiscal year. Current expenditures, excluding debt service, for the first six months ending September 2016 are $471.8 million. This is $16.1 million [3.5%] higher than the amount spent during the same period last fiscal year. Government current account spending to date is higher during this fiscal year when compared to the same period last year mainly due to increases in various operational grants, increased government overheads due primarily to health insurance premiums, and the expiry of the partial suspension of Government’s matching contribution to the Public Service Superannuation Fund. In general, current expenditures, excluding debt service, are presently tracking slightly above budget estimates. The $471.8 million spent in the first six months of 2016/17 represents approximately 51.2% of the total current account budget of $921.6 million. Capital expenditures for the period ending September 2016 are $6.8 million higher than in September 2015. This is due to increased and new capital grant amounts in particular for the Bermuda Housing Corporation [Grand Atlantic], The America’s Cup and WEDCO [South Basin]. 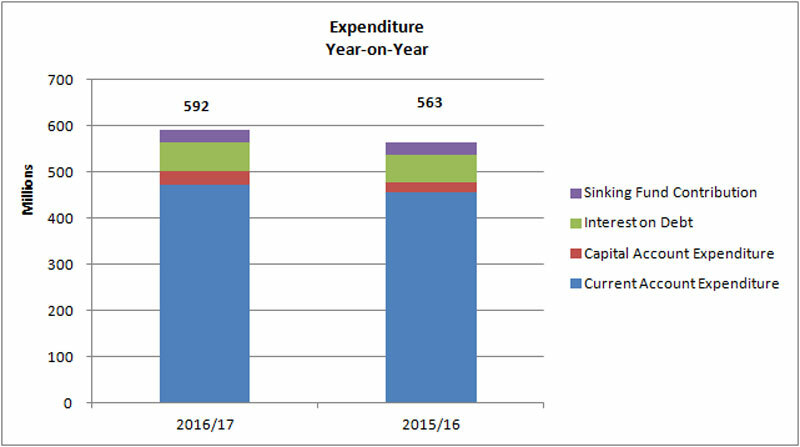 However, capital expenditures are presently tracking significantly below budget estimates. The $29.1 million spent in the first six months of 2016/17 represents approximately 33.4% of the total capital account budget of $87.3 million. Total current and capital spending to date, excluding debt service, is $22.9 [4.8%] million higher than last year’s spending. Debt service costs for the first six months ending September 2016 are $91.2 million. This represents $62.0 million in interest payments and a $29.2 million contribution to the Government Borrowing Sinking Fund. Debt service to date is $6.2 million more than last year’s period. This is due to higher debt levels. The $62.0 million paid in interest expense represents 12.6% of the revenue collected for the period. For comparative purposes, it should be noted that the average for countries rated similar to Bermuda is 4.1% of revenue collections. For the first six months of 2016/17 Government incurred a deficit of $100.2 million, compared to a deficit of $98.7 million for the corresponding period in 2015/16. This deficit was financed by drawing funds from a domestic bank Loan Facility and with working capital. Excluding debt service, Government recorded a $20.1 million current account surplus for the first six months of the year – just the second time this has happened in seven years. Gross debt at the end of September 2016 stood at $2.376 billion and net of the Sinking Fund debt was $2.289 billion. In May 2016, $30 million of Private Placement notes matured. Government drew from the Sinking Fund to pay off these Private Placement Notes which reduced interest expense by $2.094 million. *Comparative data over the first half of calendar year 2016, except when otherwise indicated. The headline rate of inflation in August 2016 stood at 1.3% year-over year. The year to date average rate of inflation measured 1.2% while the 12 month average rate was also 1.2%. The primary causes of inflation during the last twelve months were the increased costs of household medical supplies, self-prescribed medicine and health insurance premiums in the Health & Personal Care Sector; higher prices for various household goods in the Household Goods, Services & Communications Sector; and, higher newspaper prices and greater costs for pleasure boats and jet skis in the Education, Recreation, Entertainment & Reading Sector. Imports increased over the first two quarters by 1.3% to record a total of $480.7 million. The growth was mainly the result of a $9.8-million or 34% rise in the basic materials and semi-manufactured group which was driven primarily by imports of jewelry. There was also an increase of 3.3% in the imports of food, beverages & tobacco. During the first nine months of 2016 there was a 7.9% increase in the total number of visitors to the island. The number of air arrivals grew by 9.9% while cruise visitors increased by 6.9%. Over the first two quarters of 2016, total visitor spending increased by 11.7% settling at $168.4 million. 399 new international companies and partnerships were registered in Bermuda during the first six months of 2016 which is identical to the corresponding figure for 2015. The value of new projects started during the first two quarters of 2016 declined to $67.7 million, a decrease of 28.3%. Over the first half of 2016, activity in the construction industry grew from an estimated value of work put in place of $39.9 million in 2015 to $59.5 million in 2016. The vast majority of the increase in the level of construction activity was a result of substantially more activity in the offices, shops & warehouses sector which nearly tripled in value during the period. Employment income grew to $1.727 billion in the first six months of 2016, an increase of 1.7%. Total consumer spending in retail outlets between January and July 2016 grew by $16.8 million or 2.5% to register at approximately $685.9 million. Of that amount, approximately $656.3 million was spent locally while $29.6 million was spent overseas. Based on figures released by the Bermuda Monetary Authority, Bermuda’s money supply increased by 2.8% year over year during the first two quarters of 2016. The growth in the money supply was driven by higher inflows in customer deposits and the seasonal increase in notes and coins in circulation. The Banking sector’s total assets declined by 3.0% during the first two quarters of 2016. The negative movement was led by investments which fell by 19.8% [$2.1 billion] during the quarter. Loans & advances recorded growth of 11.5% at the end of the second quarter, while total deposits decreased by 4.5% over the same period. At mid-year, the economic data is consistent with the expectations outlined in the 2015 National Economic Report of Bermuda and the Ministry of Finance’s own macroeconomic forecasts. With growth in many of the key economic data, such as visitor arrivals, imports, construction activity, consumer spending and employment income, the Ministry of Finance expects positive GDP growth in 2016. I’m not sure why they bother stripping out debt repayments because we still owe it and are spending money on it… Not looking forward to increased taxes again next year, and the next and the next… You get my drift. Thanks PLP! With debt service cost reported in this release at a huge $91.2 million for the first half, as Justin says, why strip it out? The fact that it is the second biggest Government expenditure, eclipsed only by the Health budget, makes it a critically important item. This is a huge and still rising expense/payout/cost. Funny that the usual two or three race baiters do not comment on important issues such as this.